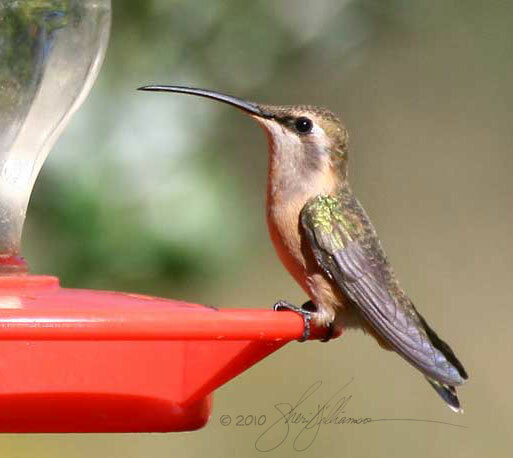 In Arizona’s White Mountains, hummingbird swarm a feeder filled with colorless sugar water. 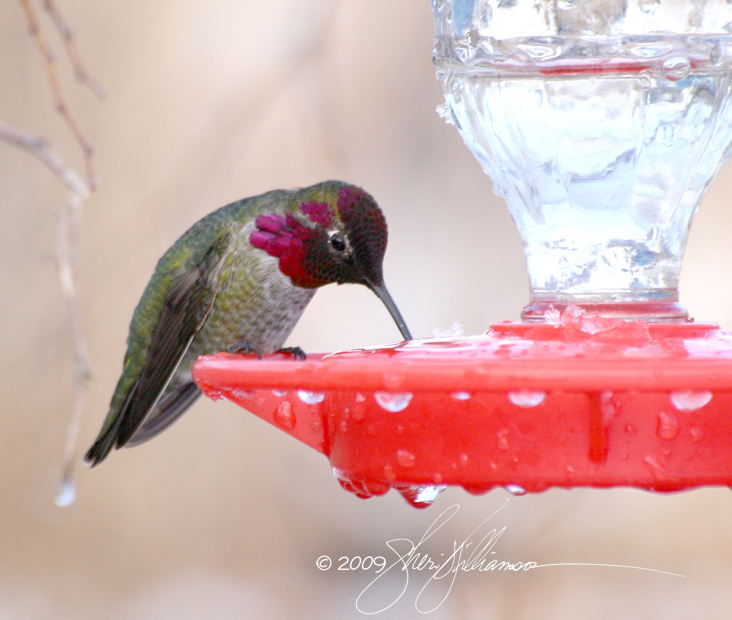 Coloring of any kind is unnecessary, and the quantities hummingbirds consume increase the health risks of artificial dyes. 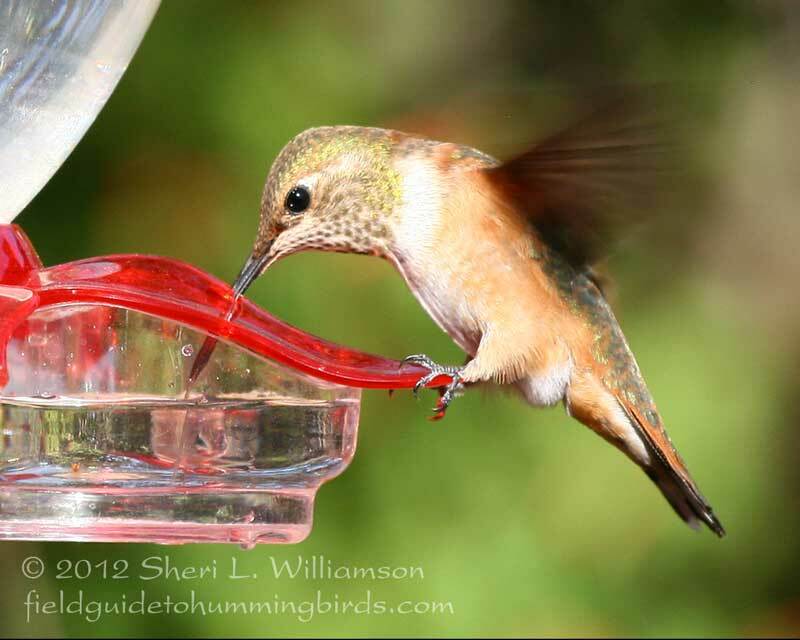 For decades, hummingbird experts have denounced artificial dyes as unnecessary, unnatural, and potentially harmful, but it’s tough to override the public image of a feeder filled with jewel-like red liquid. 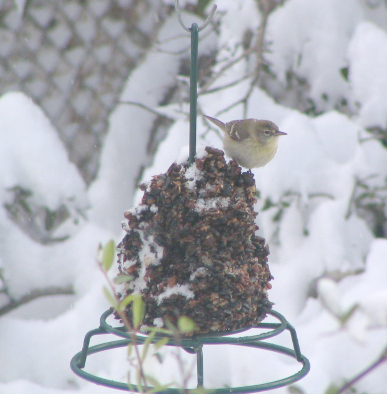 As frustrating as it is to see people still coloring their feeder solutions, it’s encouraging that some are looking for benign alternatives to artificial dyes. The natural coloring I usually recommend is a few drops of raspberry, cherry, or cranberry juice. The pigments in these fruits are antioxidants called anthocyanins. 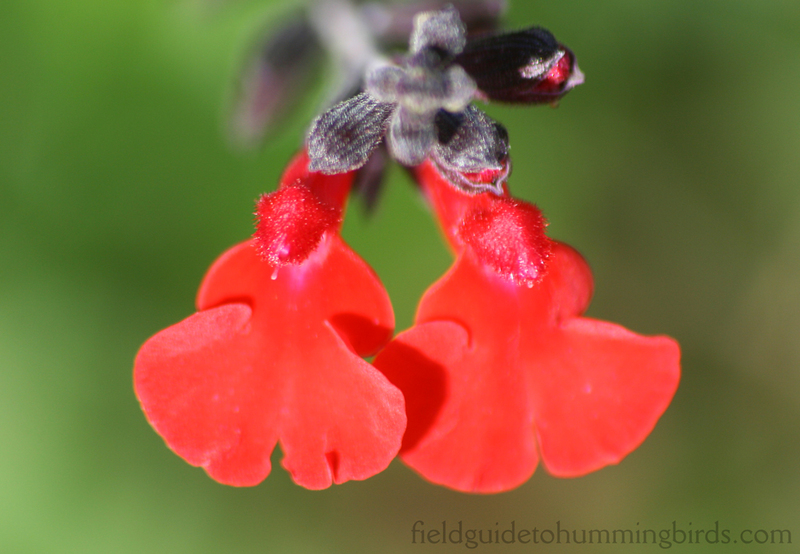 Beet pigments, called betalains, are also antioxidants and are found in cactus fruits and pollens, so they’re something hummingbirds might ingest naturally (though in vastly smaller quantities than they’d get from a regular diet of beet-red sugar water). The problem is that beets are also a good source of iron. That’s not a problem for most humans, but it is for hummingbirds and other nectarivorous birds, as I explained in Feeder Solution Evolution Part I. Vegetable-based dyes made from beet pigments are purified, so you wouldn’t expect much iron to remain. Just juicing or boiling beets runs the risk of extracting deadly iron along with desirable pigments. 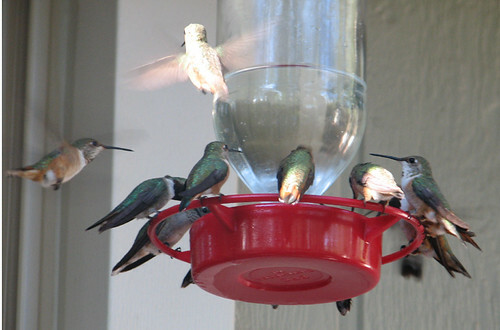 Even without the iron issue, there’s a potential stumbling block in the unsubstantiated/undebunked rumor that hummingbirds don’t like beet sugar. If that’s true, then they almost certainly wouldn’t like beet juice, either, since it would contain far higher concentrations of the bitter-tasting saponins blamed for this reported preference. 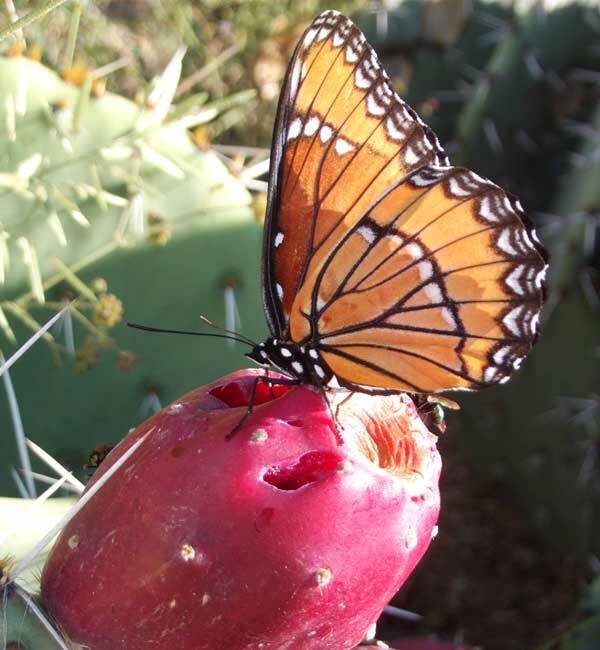 A Viceroy enjoys the juice of an Englemann’s Prickly Pear fruit. The good news is that the betalain-rich fruits of some prickly pear cacti (called tunas in Spanish) are much lower in iron than beets (Englemann/Lindheimer Prickly Pear found over most of the Southwest. If you’re lucky enough to live where this species is native, you can harvest ripe tunas using barbecue tongs. Wash thoroughly (wear gloves!) before cooking or juicing to remove dust and spines, and filter the resulting juice to remove any stray spines and other solids that might contribute to fermentation of your sugar water. The juice will keep over the winter if you freeze it in ice trays and store the cubes in plastic bags in the freezer. Then it’s easy to pop a cube into a fresh batch of sugar water (make large batches or use small cubes—it doesn’t take much to give the liquid a bright color). You can also use the juice to make jelly and syrup, color and flavor lemonade and gelatin, or add a desert touch to your Thanksgiving celebration. 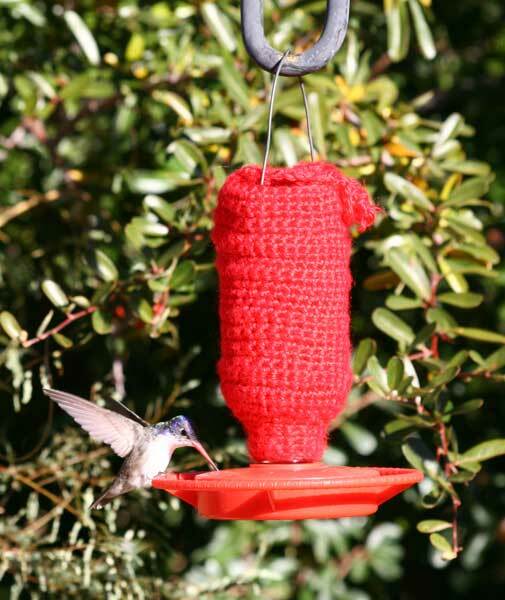 One last issue with betalains in hummingbird feeder solution is that they might perform differently depending on the quality of the water used. These pigments are pH sensitive, turning reddish in acidic solutions and bluish in alkaline ones just like litmus paper. If added to normal tap or bottled water, which is typically neutral to slightly alkaline, prickly pear juice will turn purple to violet. It won’t matter to the birds, of course, but it might take adding a few drops of lemon juice to the solution to get a color similar to that produced by artificial dyes. What a lot of trouble. Why not stick to plain sugar water?